Tsukuba, Japan, Nov 23, 2018 - (ACN Newswire) - Researchers are producing honeycomb-shaped films using an approach that mimics what happens when we breathe on a glass surface. The films have potential use in numerous applications, from tissue regeneration and bio-sensing to solar cells, explains an article in the journal Science and Technology of Advanced Materials. Tohoku University materials scientist Hiroshi Yabu reviewed the latest research on the fabrication of honeycomb films using the 'breath-figure technique'. This technique builds on years of research into understanding what happens when a fog forms after we breathe onto a glass surface, and how dew droplets form. Water droplets condense when humid air is passed over certain substances mixed with solvents. They form a highly uniform, closely packed array and sink into the substance. 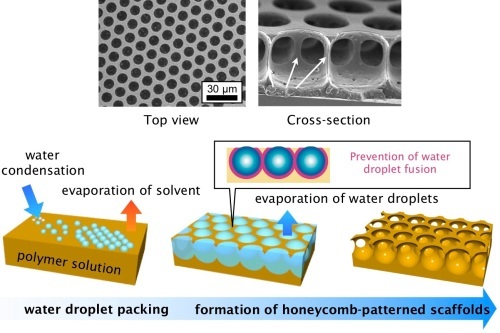 When the solvent then evaporates, a porous, honeycomb-shaped film is formed. These honeycomb films have a wide range of potential applications depending on their individually unique properties. For example, peeling off a honeycomb film from a silicon wafer leads to the formation of nano-sized spikes on the wafer, making it 'anti-reflective'; a property that could be used to improve the efficiency of solar cells. The films could also be used as scaffolding for tissue regeneration. Research is underway to develop biodegradable honeycomb films with properties that encourage the growth of specific types of cells and tissues. "The production of honeycomb films can be performed on an industrial scale, greatly broadening their possible applications in areas such as optics, photonics, surface science, biotechnology, and regenerative medicine," Yabu says. Researchers are investigating various substances and fabrication techniques to make these films for different purposes. For example, depositing metals onto already-formed honeycomb films can change their properties, such as making them conductive to heat and electricity. In contrast, films made from polyion complexes of polyamic acids can withstand heat. Films that contain 'photochromic' compounds change colour when exposed to light. Highly water-repellent films can be made using a type of fluorine-based copolymers. Scientists are also experimenting with changing the films' shapes by stretching and shrinking them, and with ways to control water droplets and the resulting pore size and shape. For example, adding nanoparticles or adjusting the airflow direction over the drying solution leads to elliptical pores, rather than round ones.